- Precipice of War begins as soon as you finish Underground Undercover, and that’s pretty much literally true, as Railroad HQ comes under attack the moment you turn in the previous quest. Hopefully you’re ready to fight right off the bat. - Once everyone in Railroad HQ pulls out their guns a cadre of Brotherhood soldiers will come in from the rear entrance, headed by a Knight in Power Armor and carrying a deadly Minigun. This is nevertheless a mistake on their part, as the doorway between rooms is really small, and you can easily chuck a grenade or two inside and take out multiple combatants at once. If the Knight manages to get into the main room, find cover and exchange fire with the other members of the Railroad. - Speak to Desdemona. She’ll point out that the catacombs are the only way to get out now. Head into the Old North Church and you’ll find Glory; once she, uh, yeah, you can snag her Minigun and a bunch of ammo. She also has a Railroad Armored Coat Mk IV on her, which is a pretty decent piece of armour. - Head into the catacombs. Here you’ll face down successive waves of Brotherhood troops consisting of unarmoured Initiates and Power Armored Knights. So long as you don’t move too quickly down here you won’t trigger successive waves, so hold back and use explosives liberally. The Knights won’t be able to flee in time, and you’ll likely blow off bits of their Power Armor and make them easier targets in V.A.T.S. - Speak to Desdemona after killing all of the Brotherhood of Steel members (she’ll have followed you up) and she’ll give you a new mission: stealing a Brotherhood Vertibird. The only convenient place to do that is at Cambridge Police Station. First, you can go through the front. This may seem like a bad idea, given how much the Brotherhood outnumbers you, but it’s only stupid if you enter the Police Station grounds. Draw the Brotherhood soldiers out onto the street, by contrast, and they’ll be forced to move through a narrow exit to get at you - one that you can bomb to hell or just turn into a shooting gallery. Be ready for more baddies up on the roof. Second, you can sneak onto the grounds by going around the rear of the Police Station. This will let you get the jump on the Brotherhood and kill several of them before they spot you. Tinker Tom will likely out you while you fight, but it’s still a good way to get the drop on your foes, and this method prevents the dudes on the roof from targeting you. - Head to the roof after killing all of the members of the Brotherhood in the Police Station. Speak to Tinker Tom. Hell give you an Explosive Charge then tell you to defend the Vertibird while he preps it. An enemy Vertibird will show up, and you can either try and shoot it down before it deploys any troops (surprisingly not that difficult) or climb into your own Vertibird and use the Minigun to demolish anybody who rappels down to stop you. - Speak to Deacon after finishing off the soldiers. 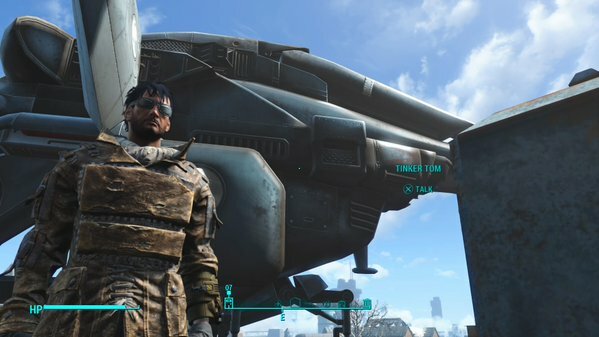 He’ll give you your reward and then invite you to hop into the Vertibird. This will end the quest and give you a new one, Rockets’ Red Glare.